When these figures were announced, Shocka asked me who Red Goblin was; I told him to just guess without looking anything up; he got it right on the first try. There's your answer, fishbulb! When Hydra took over America, Norman Osborn (whose name is spelt correctly on the packaging this time!) robbed a SHIELD warehouse facility and stole the Carnage symbiote, which had been stripped off Cletus Kasady. Norm bonded with the little symbiote, and was initially overwhelmed by its inherited bloodlust, but through sheer force of will managed to convince it that plain old murder was boring, and that he had better ideas. And then he just set about trying to kill Spider-Man, because he's not in the least bit creative. 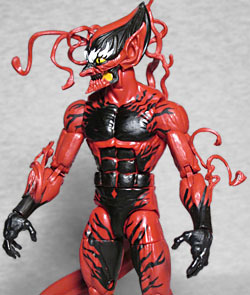 Red Goblin mostly uses the same body as the two existing Carnages, including the forearms and shins with the symbiote tendrils flailing off them. 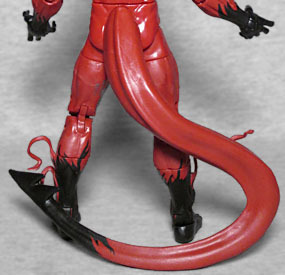 The feet have sharp toes, amd the hands have claws, though not as big as Carnage's. We can be sure the pelvis is a new mold, because Red Goblin has a long, devilish tail that no one else has sported. It's thick and has a barbed tip, and is sculpted swooping from one side to the other. Yes, just sculpted - it's not bendy or articulated or anything. The head is great. For once, the symbiote isn't copying Spider-Man's look, because you know there's no way Norman Osborn would settle for that. Instead, the goo has formed a more typically "Goblinish" visage: big pointy ears; a long, swooping head to suggest the shape of his hat (or Willem Dafoe's helmet); and a pointy nose and chin. His eyes are yellow with black slit pupils, while Carnage's usual white eyes have been relegated to being big wild eyebrows. 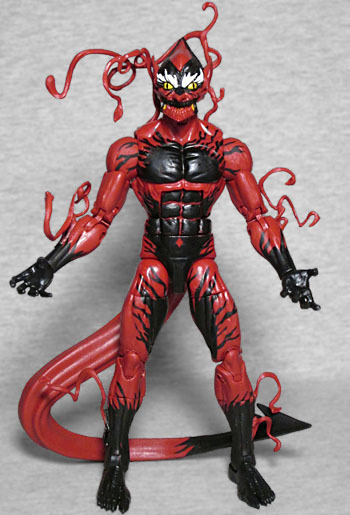 Naturally, the body is red and black, but the pattern is different from Carnage's typical swirly look. In the art, it ends up looking like an internal light shining through deep shadows, which is something the toy attempts to do. It doesn't quite work as well on plastic as it does on the printed page, but you have to admore the effort. And either way, it creates a look that will keep him from blending in with your Carnages. As we said, the tail isn't bendy, so there are no surprises in the articulation. And since he gets the "Carnage tendril" limbs, you can probably guess he also gets the little bundle of goo that plugs into his back, as well (if, you know, you haven't already spotted it in all the pictures we've posted). He does, however, get one more accessory: one of his "Carnage bombs," the upgraded version of his usual pumpkin bombs. The Carnage Bombs display intelligence, being able to track their target and even talk before biting and exploding, and this toy comes with one of them, an entirely new mold with a yellowy-orange base/mouth, red and black body, and large white eyes. We also receive the right leg of the Kingpin BAF. Norman Osborn wasn't the only one who got a power upgrade in this supervillain team-up: by melding with the Goblin formula in Norman's veins, the symbiote lost its weaknesses to fire and sonics, meaning this one villain is even more dangerous than the two separate ones were combined. Red Goblin may not exactly be a "new" villain for Spider-Man, but he makes for a pretty interesting action figure.